Friends, I continue my battle with my own brain and its attempt to disallow me my favourite thing in the world: reading. I've taken some very much appreciated blogular advice and am not even trying to read anything but the lightest of light, fun stuff (which, for me, tends to translate as children's and YA lit). I've begun with Neil Gaiman's The Graveyard Book and it turns out that was a damned fine idea. What a delightful book! A lot of story, some nice pictures to accompany courtesy of Dave McKean, and the crackly, taped-on Broadart covering the book (because it's from the library). All these things together provided me with the superexcellent reading experience I needed. In case you don't know or trust Neil Gaiman sufficiently to just read every damned thing he's written, The Graveyard Book is about a young boy who escapes his intended murder at the hands of a bad and mysterious man named Jack; the rest of the boy's family doesn't escape, unfortunately. The boy (later to become known as Nobody Owens; Bod, for short) toddles off, unaware of the danger he's in, to a nearby cemetery where he's protected by the local inhabitants who most people can't see. He's given Freedom of the Graveyard which means that, besides growing up with a family of ghosts, he possesses some of their powers and freedoms. It's grim, spooky, and fun; Gaiman never lets things get too dark for, I think, he can't forget just how good reading a crackly library book should be. If this summary which doesn't spoil anything doesn't convince you, the first line should: "There was a hand in the darkness, and it held a knife." Simple. Perfect. I have several more hardcover, Broadart-bound, crackly, YA novels from the library to choose from next and they all look so good that I don't know where to begin. In any case, I hope I'll manage to do some of this reading in a park somewhere. A crackly library book in the grass with the sun sneaking its way to me through the branches of the trees above? The circle will be complete. You should give yourself a treat and listen to The Graveyard Book audio, which is read by Mr Gaiman himself, and is like sinking into melted chocolate. Ooh, "crackly" is just the right word for that delicious sensation. Glad you found something to your taste at last! Gaiman's readings are a real treat. He reads spooky as well as he writes it. Graveyard and a few others I haven't gotten to yet are in my TBR pile. I read this book last year and loved it. I had such high hopes for this latest from Gaiman, even going so far as to buy an autographed edition. Sadly, I was disappointed. Perhaps your reading slump arrived early for me? I'm still trying to finish reading books I promised to review so I can get to what my heart is longing for: more Japanese lit, something from Borges, anything not 'required'. Moony: Yay! It definitely seems to be widely popular; I love it when quality and "widely popular" make friends. Biblibio: Quiet plastic...have these librarians no consciences? No hearts? We need to package this sound - like "new car smell" but much, much better. Bellezza: "Anything not required." Oh, lady, I know from experience what a world of discomfort is in that phrase...here's hoping we'll both be reading only and everything we want and love asap. 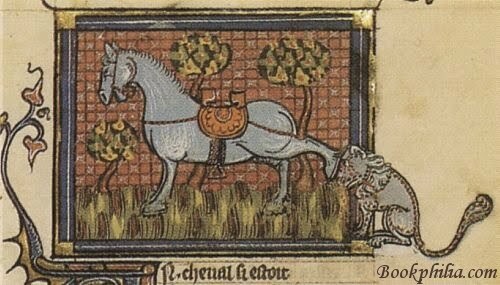 heidenkind: No, not bad you. Borrowing a book from the library is a good deal for libraries; patrons are free storage spaces - can you imagine what would happen if everyone returned their books and no one took any out again? Our libraries would sink into the earth from the sheer weight of all those books being in the same place simultaneously...! Colleen: I really liked Anansi, but American Gods and Neverwhere are tied as favourites. The latter was the first book I read by Gaiman. I haven't read the whole book but have read a chapter of it that appeared in part of a short story book Gaiman published when he was working on Graveyard Book and I liked it very much. I'm considering inclusing it as part of RIP Challenge in the fall. Glad you enjoyed it! and yeah, thos plastic coverings on library books are definitely part of my happy reading memories. 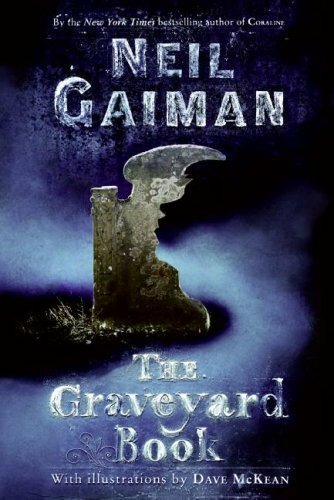 Gaiman just became the first author to win the Carnegie and Newberry awards for the same book - The Graveyard Book!